Let me start off by telling you all that this is my 100th post! One hundred! Dear me, I didn't know I could harp on for that long. And to celebrate? An Outfit Post of course. This is my favourite outfit at the moment, and we've had a beautiful day of sunshine in the UK today. I wouldn't have worn opaque tights if I didn't have fuzzy legs. Woe! DRESS: Ebay (via Primark) £10. PINS (ON JACKET): Heidi Seeker, £3 and Interpunk £1.50. POINT OF FASHION: Casual prom. I went shopping with my mam and sister today for some last minute bits and bobs for my holiday, since we set off on Thursday morning - yippee! 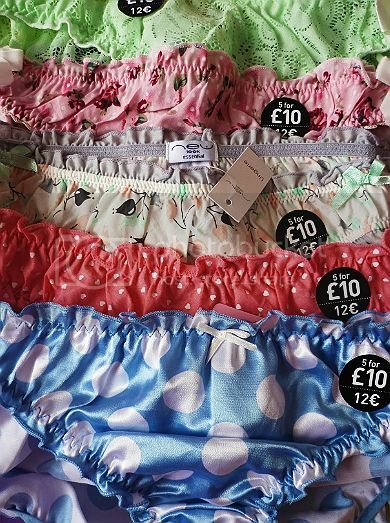 My mam was kind enough to buy me £20 worth of knickers in New Look. I've been in dire need of an underwear overhaul! I got ten pairs altogether, but these are my favourite five. Ooh my botty is rather looking forward to having new threads. Now that's a disturbing mental image, no? I also needed to stock up on a few cosmetics. Notably a dupe for my favourite nail polish - Marylebone High Street by Nails Inc. - which is sadly no longer available. My favourite nail polish brands Barry M and Rimmel let me down, but I spotted on by 17 Cosmetics called 'Fairy Cake' (HOW cute a name?) which is near identical. Even a bit paler if anything. Now, I've never really checked out 17 before, because frankly I'm a bit of a makeup snob and they always looked a bit cheap for me. Which is rather unfortunate as having a proper look today, their stuff actually looks lovely. The consistancy for the nail polish is MUCH better than Nails Inc., looks opaque after just one coat, and dried in a few minutes. Result! I ended up also buying a gold nail polish (colour I've been after for ages!) and a new eye pencil. And if you spend over £6 you got a free 'Travel Makeup Kit' including a full-sized pale pink lip gloss, coral nailpolish and mini black mascara. Bargain! The packaging is so adorable as well for the Travel kit. I love anything to do with travel, so this ticket all the right boxes for me. So yes, a lovely little shopping trip. Even though he doesn't read this blog (I think) can you guys all send good-thoughts to my Uncle Paul? He completely surprised sister and I by making a very generous contribution towards our trip, which we had no idea about until yesterday. We were honestly gobsmacked, so thank you thank you to Uncle Paul. Congratulations are in order for darling Beth from Pretty In Plus who got married this Saturday. The pictures from her blog and Twitter look beautiful, and I can't wait to hear all about it. 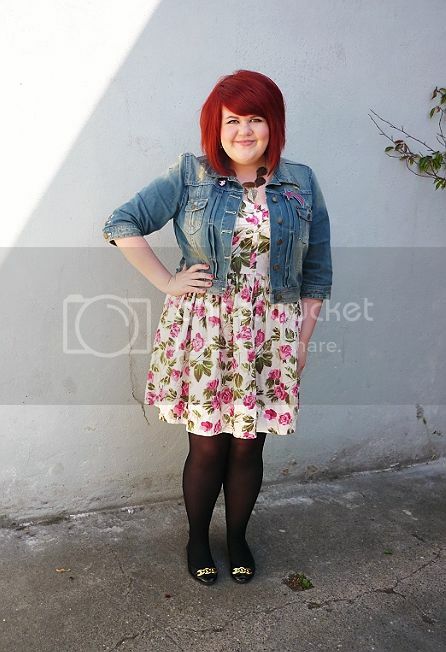 Also, thanks to the lovely Monique from Curves And Chaos who featured me on her blog this week. Be sure to check it out. Finally, a lovely girl I know from uni called Anna Leigh has kindly invited me to her album launch in August. She writes and perfoms beautiful folk-pop music, so please give her stuff a listen to via MySpace or YouTube. Also, her music video for Let The Music Take You There, which is on a seperate account. I hope you're all keeping well. As always, feel free to get in touch with me about anything and everything - and I'm also on Twitter as well. I've just realised that I'm nearing 400 followers on here, which is frankly insane. Really? Nearly 400 of you enjoy my rambling?! I've also had orders from my friends - everything from themed Pandora charms to Kat Von D makeup! Thank goodness I love shopping, right? But of course you all knew that already. Your hair (and the rest of you) is looking fabulous! And those underwear are just gorgeous! Have a great time on your hols. How sweet of your uncle as well! Alex: I know, it was just so completely unexpected! I think I'm going to have to get my bum down to Boots to check out this 17 offer - the free gift looks well worth a look..! you are beautiful miss :) love your blog. Congrats on your 100th! Love the outfit pic! I haven't bought anything from 17 since I got a lipliner called morticia which was like a metallic greyish-brown when I was about 15 and for some reason thought it would be a good idea - turns out it really wasn't! Have a fab holiday! congrats on the 100th post! you look amazing, I love your hair colour and that dress! Love the pattern on that floral dress and those nail colors look fab! Great picks! Love this outfit, the dress looks gorgeous on you! I also bought some 17 nail polish for the first time yesterday, it's much better than I was expecting. I love the free travel kit too, Boots always have such good freebies! Sarah: Haha aww don't worry Sarah we've all been there ;DD Believe me! You look lovely, that dress is so cute. Have fun in NY! You are so bad for my wallet! After reading this post, I'm throwing on my shoes to nip down to my local Boots (well, it's no stress, just a two minute walk) to check out that glorious gold nailpolish & hope to nab me a free travel kit! 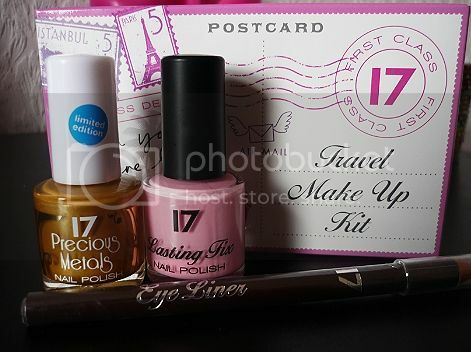 17 nail polish is great, much better than rimmel which is twice the price!